With his spiky blonde hair and fighter pilot's name, Max Chilton already possessed some of the characteristics of a modern-day Formula 1 driver. The 21-year-old from Reigate will in March join Lewis Hamilton, Jenson Button and Paul di Resta as the British drivers on the Albert Park grid for the season opener in Melbourne, having been confirmed as one of Marussia's drivers for the coming season. However, not only will Chilton be battling for positions this season, he will also want to prove he deserves to be where he is, and not on the grid because of the money he has brought with him. Chilton comes from a strong financial background with his father, Grahame, the multi-millionaire vice chairman of insurance company Aon. Having financial clout behind Chilton has undoubtedly helped him during his fledgling career to date, but has once again raised the somewhat taboo subject in Formula 1 of the 'pay driver' - someone who brings with him funding and sponsorship to help finance a team. Promising drivers needing funding to progress their careers is nothing new. Three-time world champion Niki Lauda took out a bank loan to fund his first drives, while Fernando Alonso relied on sponsorship to help him climb the motorsport ladder in the early stage of his career. "This whole pay driver thing is a pretty sad conversation to be having because someone pays all the time in motor racing, whether it is the team, sponsor, a parent or anybody," said Trevor Carlin, team principal of GP2 Series team Carlin, who Chilton raced for last season. "As it happens, Max has been in the situation where his dad has managed to help him along the way, but he has had to deliver. You do not win GP2 races because of your dad, you do it because you are fast enough. "We must not belittle any of these guys on the grid because they are all world class. If someone finishes last in the 100m final of the Olympics, you don't say they do not deserve to be there. "Unfortunately, with very few exceptions, Formula 1 is not a poor man's sport." It is a privileged position Chilton is in, and one he is no doubt appreciative of given that it is the realisation of an ambition he has held since he was a child. Motorsport was very much a part of Chilton's upbringing, with his dad a keen enthusiast, while his brother Tom, 27, has been involved in racing since he was eight and is now a well-established touring car driver. But it was likely watching Michael Schumacher dominate Formula 1 during the 1990s that really sparked Chilton's desire, and he took his first tentative steps into racing at the age of 10 through karting. Even at that early age Chilton was almost single-minded in his desire to become a Formula 1 driver, but not at the expense of his education and he juggled his fledgling career with attending classes at the prestigious Ardingly College in Sussex. Splitting his time between racing and his schoolwork meant Chilton did not compete as much as his contemporaries and though he won races during his five years, he never won a karting championship. Chilton moved into British Formula 3 in 2007, making his debut on the weekend of his 16th birthday to become the youngest driver in British F3 history. Being younger and less experienced than those around him are traits that have gone hand-in-hand with Chilton, who has always held the belief that the best way to learn and develop is by competing against the best. Consequently, his rapid ascent through the racing ranks meant he has rarely raced for a front-running team. "Max is always the new kid on the block," continued Carlin. "He has always been in a championship earlier than he should have been, so he has always had a bit of fighting to do to get there." After three years in British F3, Chilton switched to the GP2 Series in 2010, first joining relative newcomers Ocean Racing Technology, before joining Carlin for their debut in the category the following year. Carlin's first season in GP2 was hampered by reliability issues, but Chilton's pace coupled with his amiable nature, attentiveness and willingness to aid in the development of the car impressed team bosses, as well as catching the eye of Formula 1 scouts as Force India invited him to take part in the young driver test. "He is fairly quiet, but he is a confident young man. He is lovely to work with, very polite and clearly well brought up," said Carlin. "He is a sponsor's dream. He is good looking, personable and very attentive to people. "He is also really, really keen on the job. He wants to be a top Formula 1 driver and he is working as hard as he can to achieve that." In 2012, Carlin teamed up with Marussia to enter a team for the GP2 Series season. With Chilton now having the car capable of challenging for victories he converted his promise into results, finishing in the points on 15 occasions and winning races on the tricky circuits of Monza and Singapore on his way to securing fourth in the championship. He was also the top points scorer in the second half of the season. 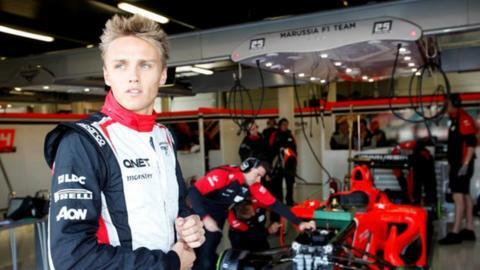 In July last year, Chilton took part in his second young driver test, this time with Marussia, who subsequently named him reserve driver for the final six F1 races of the season. Do pay drivers pay off? One of the sport's greatest, Argentine Juan Manuel Fangio, was a five-time world champion in the 1950s, but he would probably never have made it to Europe without the backing of the Juan Peron's government. Brazilian Pedro Diniz drove for Forti, Ligier, Arrows and Sauber during a career financed by his father's supermarket chain and other business interests. Despite achieving some modest points finishes, he's best remembered for escaping a huge fire during the 1996 Argentine GP (above). Chilton got his first official taste of a Grand Prix weekend last November, taking part in first practice for the Abu Dhabi Grand Prix and again he did not disappoint, finishing just a second down on team-mate Timo Glock. Again he impressed team bosses with the quality of his feedback. His close association with Marussia by this stage meant December's official confirmation that Chilton was to drive for them this season came as little surprise. Chilton's outright pace and consistency over a single lap has impressed in every category of motorsport he has raced in, and that will undoubtedly be where his strength lies this coming season. Self-confidence on a race day is perhaps where Chilton currently falls short. In GP2 last year, he often played it safe rather than gambling on potential overtaking opportunities. Nevertheless, the feeling from those who have seen his development first hand is that he will more than prove his worth this season, and perhaps surprise a few people along the way. "Max has a natural turn of speed and I think that is what people will see," said Carlin. "From a pace point of view he is right up there with any of the drivers on the grid, no question. "I can guarantee 100% he will not embarrass himself at the first race this season."